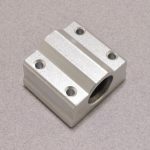 Shaft couplers are an important part of a CNC machine or drive system – they are designed to connect two drive shafts together. Because things don’t always line up perfectly, these shaft couplers have a helical cut in the body which allows minor flex in the X, Y and Z axis while not allowing any flex in the rotational axis. This design means the coupling will be much less prone to binding due to minor misalignments without contributing any additional backlash. 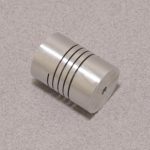 This specific version is designed to couple a 1/4” shaft to an 8mm shaft and is perfect for connecting our large 125 oz-in Stepper Motor to something like an 8mm Rod or 8mm Lead Screw . SKU: ROB-092. 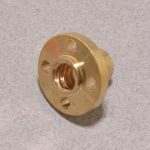 Category: Couplers and Adapters. 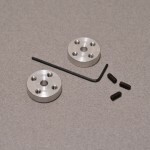 Tags: 8mm, CNC.